Whilst it is theoretically possible to design an orangery that is exempt from building control if the proportion of glazing is high enough, in practice most orangeries are required to meet building regulations approval. If there is to be no external doorway between the existing building and the new orangery, then building control approval will certainly be required. There are firms/clients who shy away from obtaining building regulations approval due to the perceived hassle and cost, thereby compromising the end result. This is a false economy, whilst it’s true that some additional expense is involved, our experience and expertise allows us to deal with this efficiently and cost-effectively. There are three main issues that need to be addressed; the insulation properties, the suitability of the foundations and the structural integrity. All new extensions, quite rightly, have to conform to high standards of thermal insulation, the measure of which is the u-value. The lower the u-value of a material, the better degree of insulation it provides. Generally, modern double glazing has a u-value of around 1.6W/m2K. This is for a low-e glass such as Pilkington K with a 20mm space between the panes. Older-generation double glazing would have a u-value of around 2.8W/m2K and single glazing has a u-value in the region of 5.6W/m2K. Pilkington k glass seems like a big improvement at 1.6W/m2K, until you consider that modern cavity walls are required to have an insulation of 0.28W/m2K, floors and roofs should be around 0.2W/m2K. The current regulations state that if the individual components meet their respective u-values as mentioned above, then the glazed area of the extension should not exceed 25% of its floor area, plus the area of any windows or doors that were removed to create the new opening. Clearly, this does not allow for the new extension to have much glazing. We can increase the area of glazing by using a glass with an better u-value than the 1.6W/m2K required for standard windows. Currently glass with a u-value of around 1.0W/m2K is the best that is economically viable for domestic extensions, however this still significantly falls short if the 0.28W/m2K u-value requirement for cavity walls. In most situations we will commission a SAP (Standard Assessment Procedure) survey of the entire property, where we will look at its overall energy usage. We then calculate the level of CO2 emissions there would be for a notional extension that would conform to the 25% glazing rule. The next step is to calculate the CO2 emissions for the proposed orangery and prove that the dwelling as a whole will have lower emissions with the orangery than with a notional extension. This may be achieved by increasing the level of insulation in the floors, walls or roof, or by undertaking energy efficiency improvements elsewhere in the property. This may sound like a lot of work, but it’s really quite simple and something we are used to dealing with. 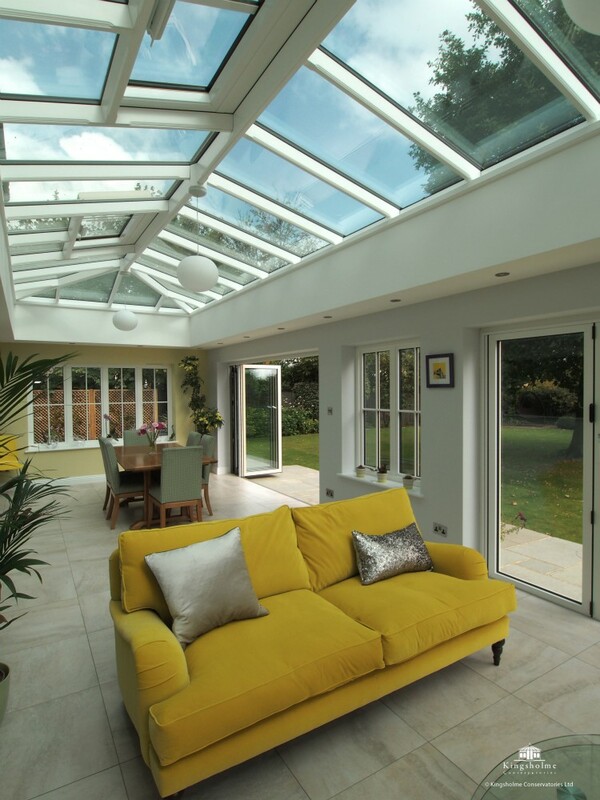 One of the reasons orangeries have become popular is because they provide a more substantial living space than a conservatory, but with more light than a standard extension. They will often enhance the value of a property to a greater extent than a conservatory, with the proviso that the relevant permissions are properly obtained. The foundations for an orangery will need to be to conform to the same standards as a typical extension in order to be approved by building control. This will mean a minimum depth of one metre, but more if the ground is unsuitable and/or there are trees close by. It is quite usual for us to have to excavate foundations that are significantly deeper than those on the main house. This is primarily due to general improvements in build quality standards, but arguably over-specification due to the fear of repercussions in the modern blame-compensation culture also has an influence. In the local area, the combination of clay and trees present the biggest hazard. Certain trees can draw a lot of moisture from clay which will cause the clay to shrink. This shrinkage can lead to movement and structural problems. We use the NHBC foundation calculator to determine the correct depth for footings, building control officers also rely upon these formulas. The relevant factors are the type of clay, (high, medium or low shrinkage) the mature height of the tree (the height to which it will grow rather that its current height), the water demand of that species of tree and the distance the tree is from the new building. Digging deep foundations can be a time consuming and problematic operation, particularly if access for machinery is limited. Often it is more economical, quicker, cleaner and safer to use mini-piles; steel tubes that are filled with concrete. These are driven down to a depth of around seven metres by a highly portable rig until they reach the required degree of resistance. Again, it may sound involved, but it’s imperative the foundations are laid correctly. Whichever method we use, we are normally “out of the ground” in less than a week, and on to constructing the more interesting parts of the orangery! We would normally supply building control with structural engineer’s calculations to prove the structural integrity of the orangery and its critical components, this is a fairly straight forwards process. At the same time we would specify any structural supports that are required to form the new opening from the house.